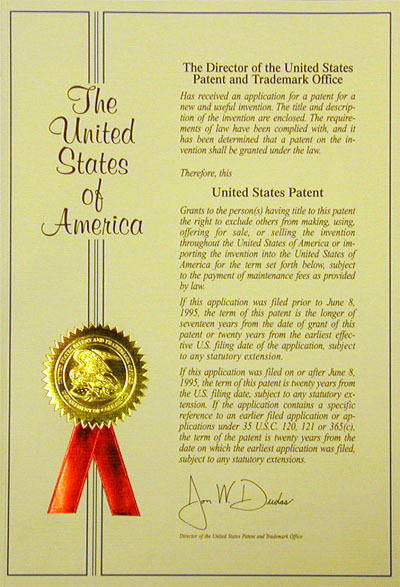 When the Patent and Trademark Office (PTO) issues a patent, the PTO sends a Letters Patent to the owner of the patent. The Letters Patent is an official certificate that contains a copy of the issued patent. The outside cover has a gold seal and a red ribbon. Inside the Letters Patent is a copy of the issued patent. Although the Letters Patent is an impressive document to receive, the Letters Patent does not identify on its face any information about the patent. Many patent owners purchase patent plaques displaying the first page of the patent. Sources for plaques include Plaque Maker, Patent Plaques, and Patent Awards, to name just a few of the many sources. Knox Patents is not affiliated with any of these companies and offers this information as a service to patent owners.